Compact crossovers offer the versatility of a crossover with large cargo areas and ample passenger space but they offer fuel economy more in line with a sedan and feature fantastic handling. Crossovers have never been more popular so the choices can seem endless. Take a look at our 2017 Mazda CX-3 vs 2017 Nissan Juke comparison to see how these two compact crossovers compare in fuel economy, engine, interior volume and more. The CX-3 is Mazda's entry-level offering in its crossover lineup and it debuted just last year so the 2017 model year is largely unchanged. The light curb weight and fuel-efficient engine gives the CX-3 31 mpg combined and for buyers that opt for the all-wheel drive, the CX-3 still delivers with 29 mpg combined. The 2017 Mazda CX-3 proves to be an affordable choice for buyers looking for a crossover that offers the best of both worlds. 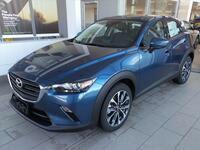 The CX-3 offers practical cargo space that would make any customer happy. The Mazda CX-3's 44.5 cubic feet of cargo volume is nearly 10 cubic feet more than the Juke's cargo volume which is just 35.9 cubic feet. Mazda makes the adjustments to what customers want from a compact crossover without making any sacrifices. The CX-3 is available in Sport, Touring and Grand Touring trim levels and each one adds its own personality and standard features. The base Sport model starts off strong with a long list of standard features that some competitors save for their higher-end models. The CX-3 Sport features standard automatic headlights, a rear roof spoiler, push-button start, Bluetooth, a rearview camera, a 7-inch touchscreen and more. The 2017 Mazda CX-3 is available now near Waukesha and Hall Volkswagen in Brookfield. Hall Volkswagen is part of the Hall Cars group in the area. Use our website to schedule a test drive or call the dealership directly for more information.